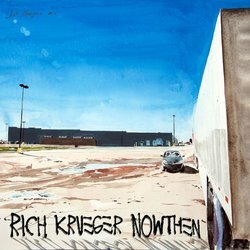 Rich Krueger sets out his stall from the start: “My body of songs are coming from two different periods in my life: ‘Then’ is from 1985 to 1988, ‘NOW’ is almost a 20-year gap later when I started writing and performing again in 2007.” Confused? You will be. Especially when you listen to ‘Kenny’s (It’s Always Christmas In This Bar)’ and ‘Girls Go For Assholes’ – if you know those names, you’ll recognise these numbers. ‘NOWThen’ is full of cautionary tales and homespun wisdom, often played out over melodies as old as the hills, strummed acoustics, female harmonies and rockabilly licks. “I’d tip my hat to Kenny if I could only find my hat” is a line that should put you in the picture. Good time rock ‘n’ roll? Perhaps. Chicago man Krueger has had rave reviews for his past work (2017’s ‘Life Ain’t That Long’ caught the attention of No Depression and Robert Christgau, apparently), but there’s nothing new to hear here. Stories are spat out in a conversational baritone as the band plays on. ‘Don‘ is the standout track and features Gary Lucas (Captain Beefheart) on resonator guitar, but in truth it’s an island of grace swimming in a sea of mediocrity. Krueger’s passion is obviously infectious, but the tunes just don’t leave their mark. Are you living the life you chose or are you living the life that chose you?